This is sponsored post on behalf of Panera Bread. All opinions are 100% my own. It is not easy staying healthy in an environment where fast food is abundant on almost every street corner. Normally, people say that the easiest way to be healthy is just to eat at home. That way, you know exactly what is going into your food—healthy and otherwise. I, however, am not the greatest cook so I like to eat outside of my home. 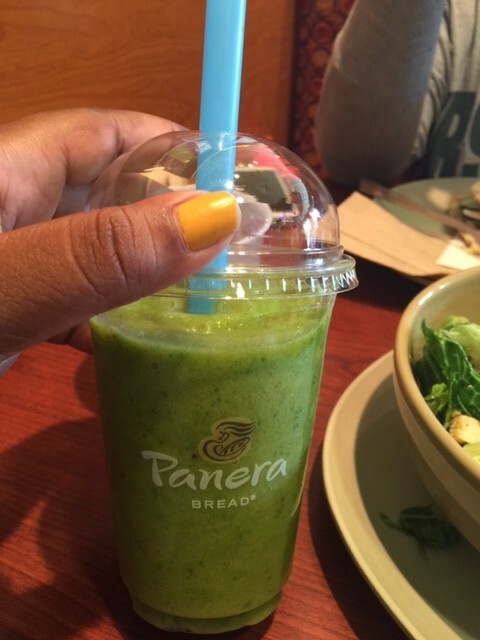 This brings me to my new favorite place to lunch – Panera Bread! I recently learned about this, and I was so happy that I did. It gives everyone a lot of different healthy and delicious choices. Here are a few of the yummy options that my sisters and I were able to try! My sisters and I decided to make a change and try the new options. I chose the Strawberry & Poppyseed Chicken Salad with a Green Passion Power Smoothie. This was one of the best healthy meals I have ever had since I started eating better! This was the first time I had ever tried lettuce with fruit. It always seemed to be too weird for my simple taste buds, but the blueberries, mandarins, pineapples and strawberries worked very real together. The smoothie was a great addition to my meal. The combination of peach, mango, spinach and more was refreshing, and honestly left me wanting more and more with each sip! And the fact that it was only 200 calories made it that much better. One of my sisters, Jan, wanted to try these two. She liked the new and extra healthy spin on the Classic Caesar Salad. With half of the dressing—in a good way—she swears that this salad was definitely her favorite choice by far. Strawberry banana smoothies are always a delicious treat in the summertime and this one was especially fresh and filling. My other sister, Jo, really liked her salad as well and said her favorite part was the sesame seeds. None of us had ever seen those on a salad before so it was a nice change up. She complemented her salad with frozen lemonade – a perfect zippy drink to go with her flavorful salad. Now, we were all about the salads on this trip but for those who want something else for their palate, try their flatbread sandwiches – also a tasty and healthy option for lunch. Overall, Panera Bread is a deliciously fabulous place to stop after a morning class or workout, to meet up with girlfriends for lunch – really any time of the day will do. Go out there and try out some healthy choices of your own and tell me what you think!